When my husband and I were first married, we were dirt poor. I mean, everyone had everything they needed (and I lost some good friends/family by insisting that in certain circumstances raising a family didn’t have to be crazy expensive), but we were living paycheck to paycheck. Occasionally, I did have to rob Peter to pay Paul. We made it work though by budgeting, and strictly adhering to that budget. I’m still amazed to this day when I reflect on the fact that I was consistently able to feed my family of 5 (at the time) on anywhere from $50-75 a week. Like that’s almost impossible to fathom nowadays. It’s nothing compared to what I spend now per week! I know I’m not misremembering either, but sometimes even I still wonder how it was possible. Guess it’s one of those, you do what you have to and make it work things? The old adage still rings true today, where there’s a will there’s a way! One of the best ways I was able to do that was by cooking a giant pot of something. Rice, for example. The next logical step was to incorporate that into several meals for the week, whether it was as a bed to serve a main dish over, or stirred into the pot, or even included in a soup. Nothing was off limits in my novice kitchen, especially if it meant turning one ingredient into multiple hearty dishes. It also cut down on the time I spent in the kitchen, or rather as another old adage goes ‘chained to the kitchen sink’, in half. Considering that the math I learned 20 years ago is no longer legit math, or even taught to my own children in schools, I’m glad things still make sense in my own kitchen. Mathematic-wise, at the very least. And that they made sense and a world of difference in the elementary school classroom my three oldest boys attended years ago. It just made sense that some of these simple recipes would stick with us, even after our grocery budget grew. 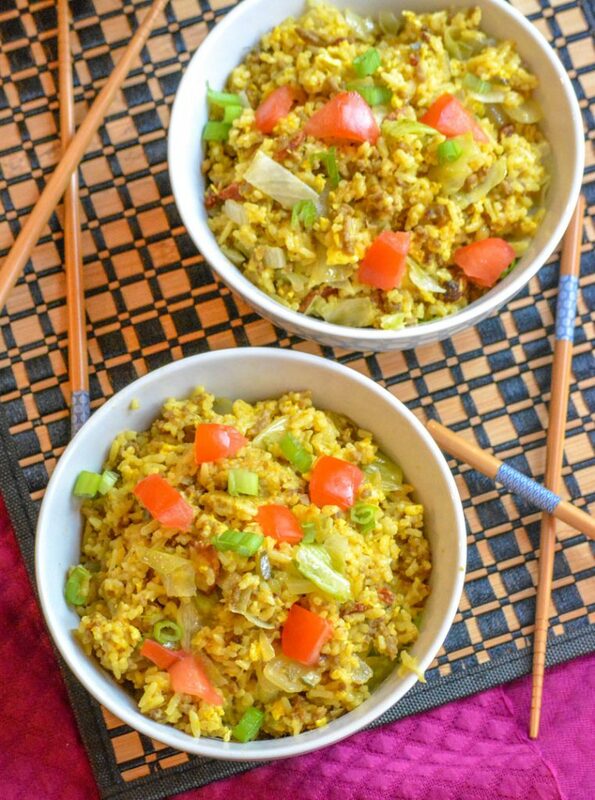 While I’d love to say all things stayed the same (clearly, things change over time everywhere), my classic newly wed fried rice recipe eventually underwent some changes. 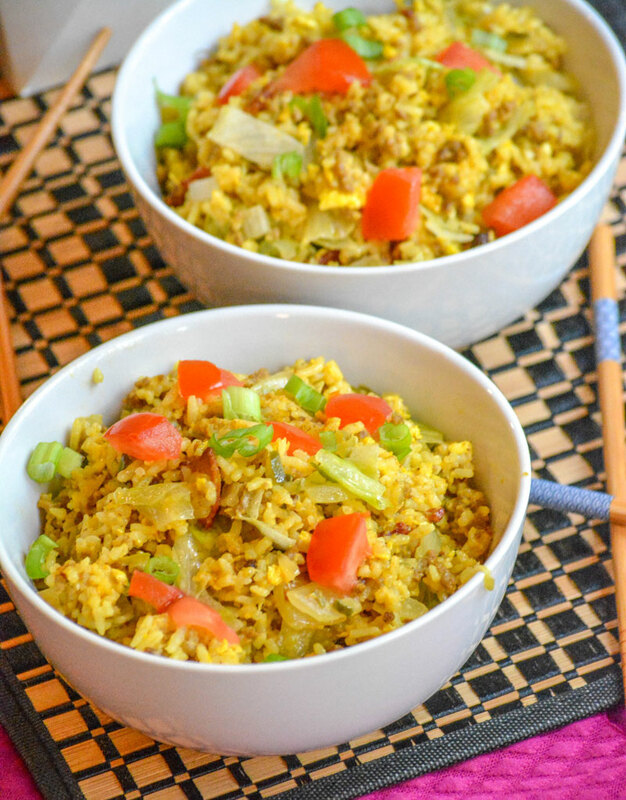 The most notorious being when I sprang for some fancy sprouts and included them in a super yummy Brussels Sprout Fried Rice version, that even the kids loved. They were floored when I finally let them in on the secret. My favorite though, was when I stumbled on a genius idea to combine fried rice with the classic flavors of a bacon cheeseburger. I know, it probably sounds a bit crazy at first. 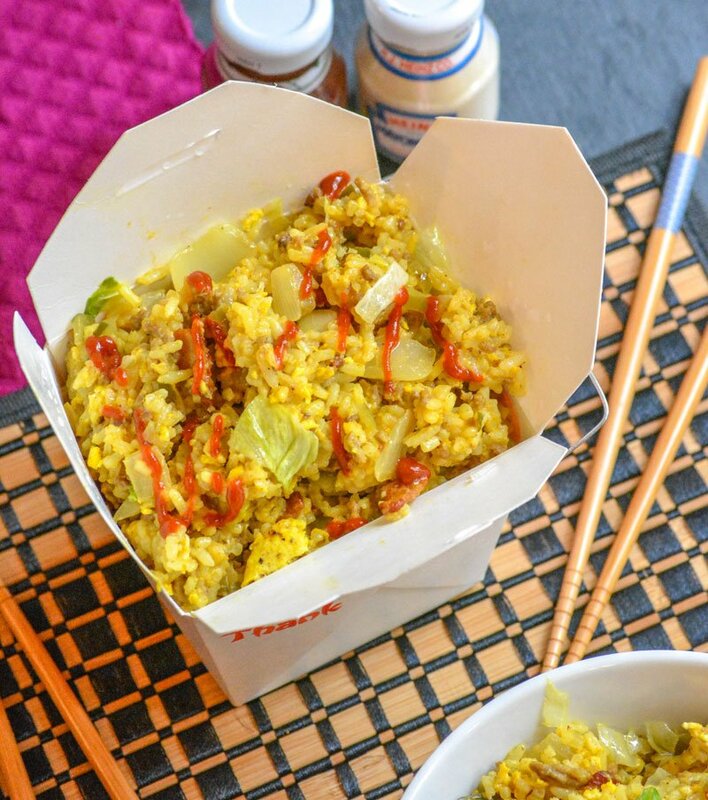 One whiff of cheeseburger fried rice being tossed in a wok on the stove top, and your tastebuds, eyes, nose- basically all of your senses- will be sold. I’m sure at this point, you’re probably wondering exactly what goes into making Cheeseburger Fried Rice, well cheeseburger fried rice. Let’s dig in, and find out! Obviously it all starts with rice. You need 4 densely packed cups of white rice, preferably cold & sticky. So you can make a double batch the night before and get two dinners out of it, or you can swing by the Chinese take out at lunch time and grab two totes of white rice, refrigerate, and it will be cold by supper time. For some reason, my homemade rice never gets as sticky as the take out version, and two things of white rice usually costs me $3 or less. Thick cut pieces of bacon are tossed in a wok until perfectly crisp, then onions is sautéed in the bacon grease until soft, and to this yellow mustard is stirred in. It will look like an oddly gloopy mess at this point, but trust me- not only is it the glue that will hold our whole dish together, it’s part of a secret power house of basic burger flavors. The mustard mixture’s transferred to a waiting medium sized mixing bowl, and set aside. Meanwhile, a pound of ground beef is added to the same wok, and sautéed- stirring & breaking up as it cooks- until cooked throughout. It’s then drained and transferred to it’s own waiting mixing bowl. The lightly beaten eggs are poured into the wok, and stirred continuously until scrambled and set. Working quickly, add the ground beef to the mustard mixture, whisking evenly to combine. Then transfer it to the wok, stirring to incorporate the egg. Next comes the rice, tossing everything together until evenly combined. Now we heat the mixture, stirring to toss occasionally, until hot & heated throughout. 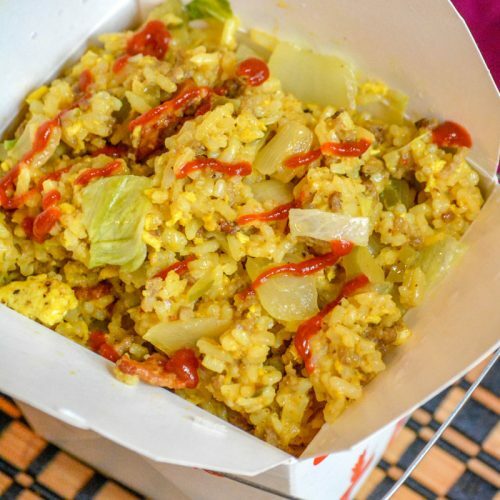 Removed from heat, the lettuce, cheese, and pickles are stirred into the cheeseburger fried rice mixture until combined. At this point, the dish is ready to be served. Depending on what kind of rice you opted for you’ve got two options. You can ladle it into serving bowls, or back into the take out containers for a cute presentation. My kids love when I serve their’s in the paper take out tubs. Whichever serving option you go for, you’re probably going to want to garnish them. Highly recommend! My kids love their’s drizzled with ketchup (that’a big eww from me, despite it being a ‘cheeseburger’ themed dish). The Hubs and I enjoy a sriracha drizzle over our own serving. He also likes sprinkling sesame seeds over his, like on his favorite burger buns. Freshly diced tomatoes and thinly sliced green onions also make yummy garnishes. And if you’re a pickle fanatic like I am, extra pickles too! Some things don’t change, and some things you think shouldn’t inevitably do- in and out of the kitchen. 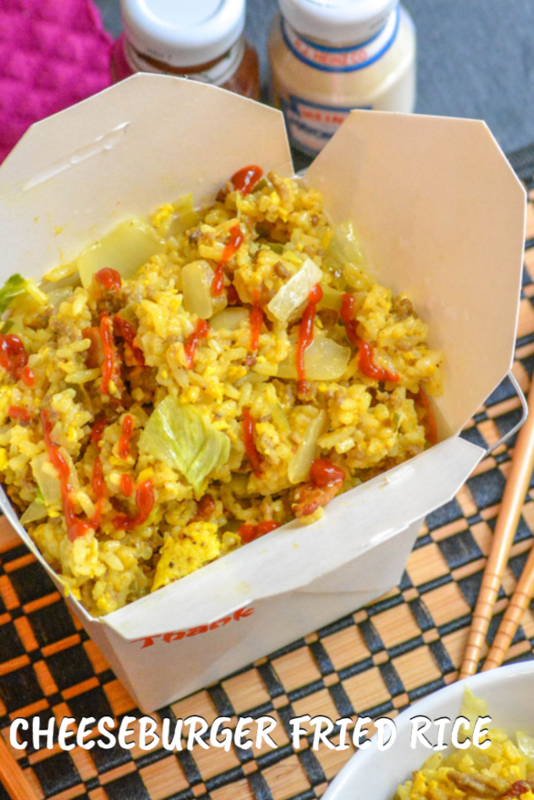 Give an old favorite new life with an Asian American fusion that combines the beloved flavors of the bacon cheeseburger with Chinese take outs classic fried rice skillet. 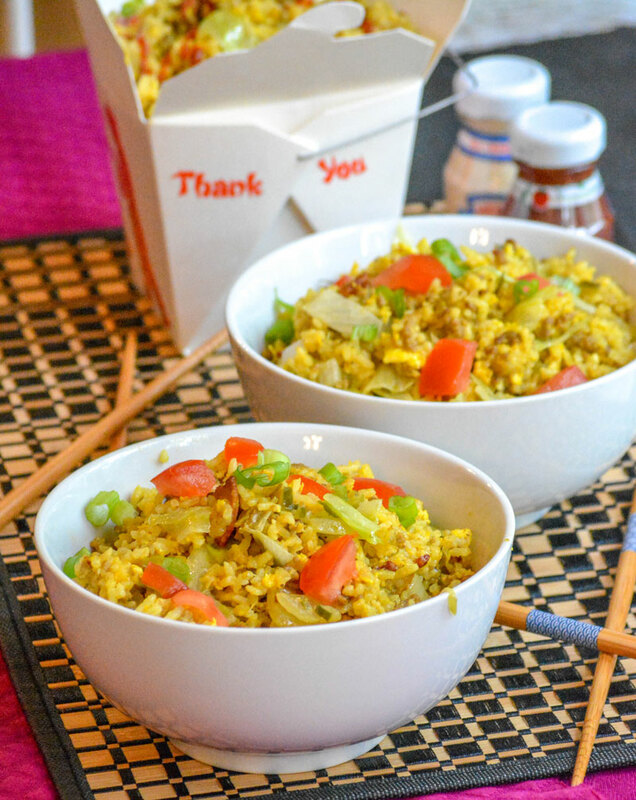 One thing’s for sure, I don’t see Cheeseburger Fried Rice going anywhere and staying on our family’s menu for quite some time. 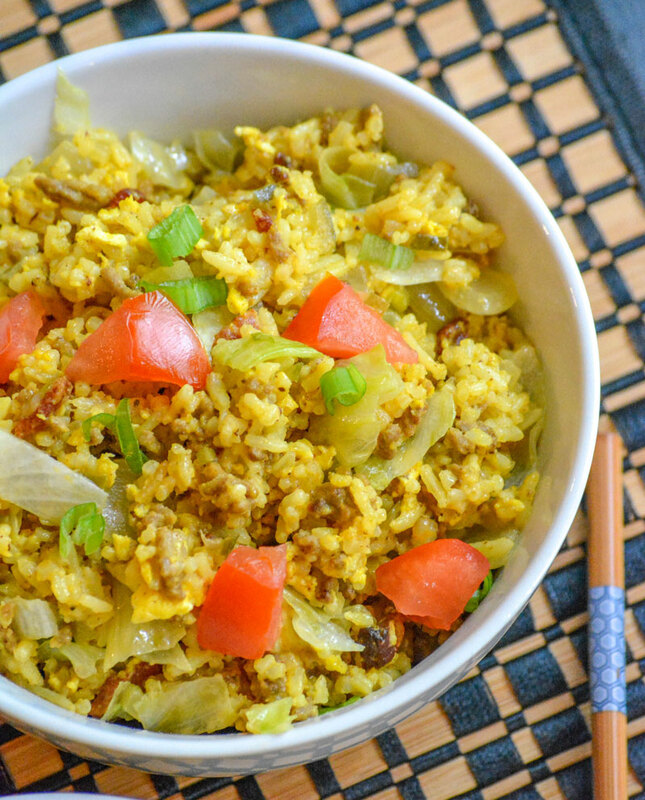 A delightful dish, this one combines the ease and convenience of fried rice with the comforting flavors of a juicy cheeseburger. Heat a wok over medium high heat. Stir in the bacon, cooking until crisp, and stirring occasionally. Stir in the mustard, and continue cooking until it's become soft and almost translucent, about 3-5 minutes. Stir in the mustard, and lower the heat to a simmer, cooking for another 60 seconds. Transfer the mustard mixture to a small mixing bowl, and set aside. To the already seasoned wok, stir in the ground beef, stirring & breaking up as it cooks. Continue cooking until completely browned. Stir in salt & pepper, to taste. Transfer to a strainer, but save 1 1/2 tbsp worth of the rendered fat, while straining the rest completely. Transfer the meat to a bowl, set aside. Heat the wok over medium heat, and stir in the slightly beaten eggs. Stir them almost continuously across the pan until the eggs are scrambled and set. Add the reserved, still warm fat back to the beef and stir to combine. Add the beef to the mixing bowl with the mustard mixture and whisk together to evenly combined. Then add that mixture to the work, stirring to incorporate the egg. 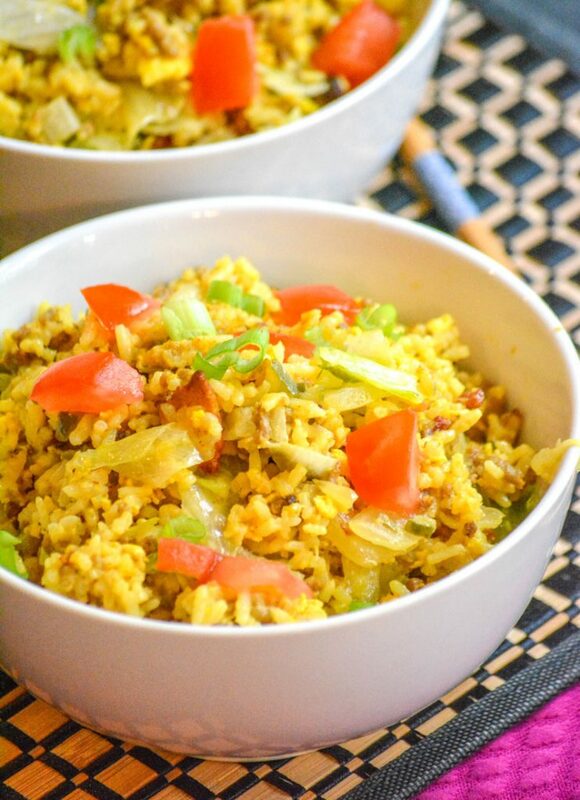 Stir in the rice, tossing until everything's completely combined and evenly incorporated. Cook the mixture over medium low heat, stirring/tossing often, until the mixture's hot throughout. Remove the work from heat. Stir in the pickles, lettuce, and cheese. 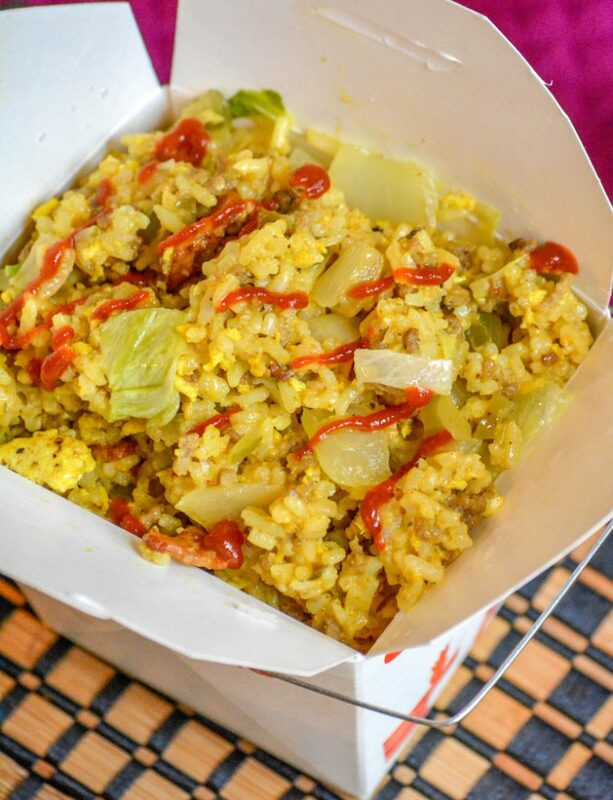 Divide the cheeseburger fried rice evenly out into bowls, or take out containers. Drizzle ketchup or sriracha out overtop of each serving, if desired, and then sprinkle with some sesame seeds, sliced green onions, and/or diced tomatoes.